Winter is ever drying on our delicate skin. In addition to our daily moisturizer, it is imperative to provide other means of hydration to the skin nd body. One way to do that is to drink up on water (at least eight glasses a day) or incorporate a hydrating face mist into your beauty care regimen. Facial mist is often packed with antioxidants which help our skin get protection from the environmental elements. Other ingredients include vitamins and essential oils. Face mist for oily skin is essential. It helps to balance the skin's pH. Face mist is also beneficial if you have dry skin, sensitive skin, or combination skin. Some benefits include: providing hydration, protecting the skin from the elements, soothing the skin, and setting makeup. 1. Evian Facial Spray: Evian Mineral Water Spray is imported from a unique underground water source at the base of the French Alps. The ultrafine pure, natural mist allows the skin to absorb a unique balance of beneficial minerals along with the water. 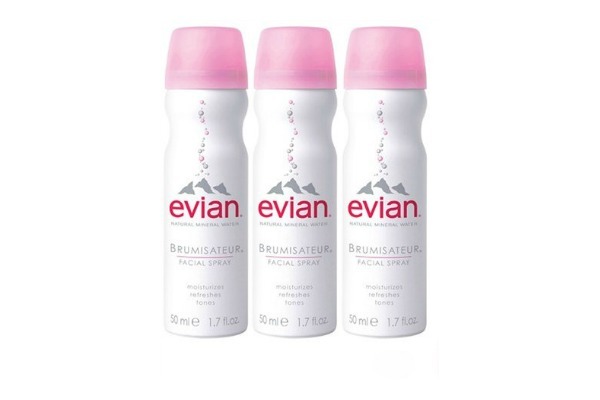 Evian facial spray soaked in a cotton ball; helps removes all traces of cleansers from the skin. Evian Mineral Water Spray helps to enhance the performance of all other skincare products by hydrating the skin before the use of moisturizers. It relieves dry, irritated skin caused by high altitude and poor air quality during air travel, which is why many flight attendants wouldn't be without it. A light spray of Evian 'sets' makeup by blending it with skin while highlighting color so it can be used all through the day. How to use: After cleansing, generously spray Evian over the entire face until it drips, wait a minute for the droplets to be absorbed, and then pat the excess dry. Follow with your favorite moisturizing cream or lotion to seal in that special Evian moisture. During the day, hold the canister further from face and lightly mist right over makeup. 2. 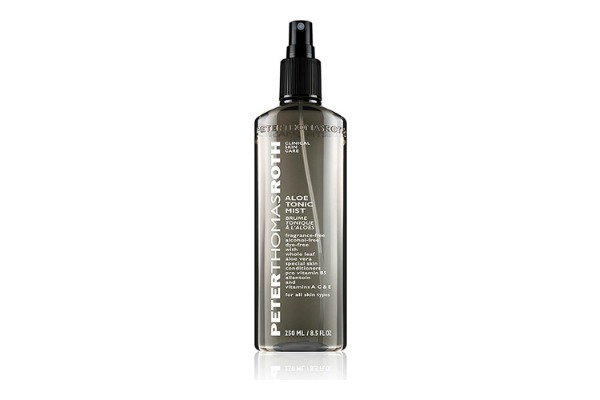 Peter Thomas Roth: From Peter Thomas Roth , the great skincare innovator, the Aloe Tonic mist combines the natural purifying qualities of whole leaf aloe vera with Vitamins C and E and Pro Vitamin B5, which provide a blend of calming and anti-oxidant benefits. It’s ideal for use before and after a facial. 3. Jurlique Rosewater Balancing Mist: This hydrating mist balances and conditions the complexion, preparing the skin for maximum absorption of serums and moisturizers. Rose essential oil, and aloe help to hydrate and soften skin, while grapefruit seed extract provides antioxidant protection. This uplifting rose mist instantly refreshes the skin and can be spritzed throughout the day for a quick pick-me-up. It’s quick drying and non-sticky finish makes it the perfect final step to keep makeup looking fresh and dewy all day long. 4. 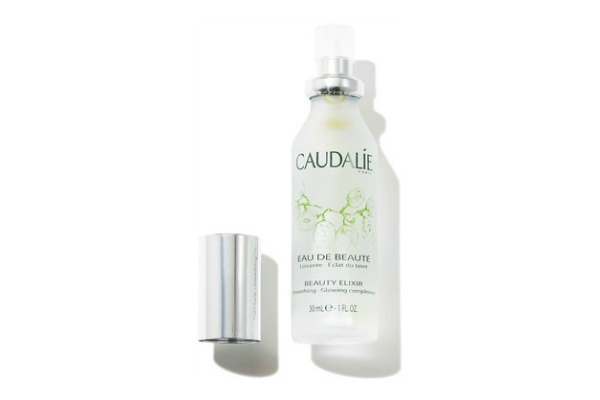 Caudalie Beauty Elixir: Inspired by the "elixir of youth" used by Queen Isabelle of Hungary, this facial mist smoothes features, tightens pores and provides an instant burst of radiance to the complexion. The spray acts as an anti-dull complexion treatment, cleanser and brightener, and also an after-shave for men. 5. Mario Badescu Aleo, Rosewater, and Herbs Facial Mist: A refreshing, hydrating mist to use anytime. Simply formulated with fragrant Herbal Extracts and Rosewater for a pleasant, pick-me-up for dehydrated, tight and uncomfortable skin. Spray during the day for a boost of hydration or use it to set make-up. Safe for all skin types. Do you use a facial mist?